It started as a miserable day. We had snow, enough for the streets to be plowed and the driveway shoveled. 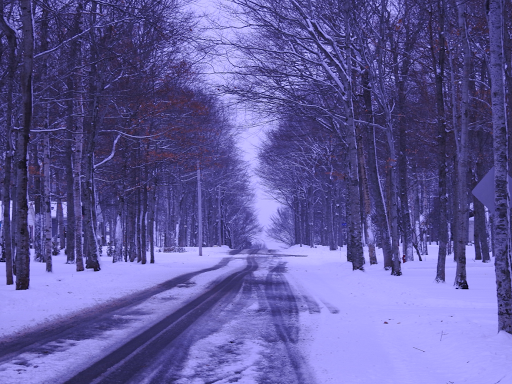 By late afternoon however, the sky cleared, the temperature rose above zero and the snow on the roads melted. Most noticeably, the wind was absent. However, storm clouds were rolling into the city. 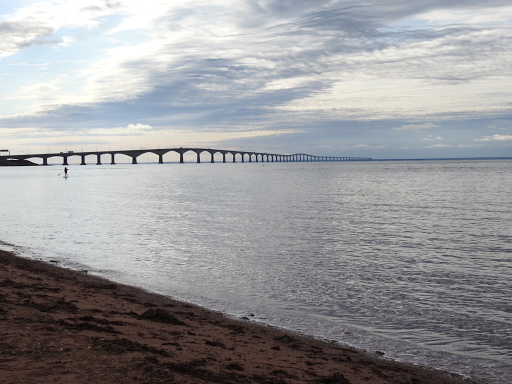 We parked by the harbour in Summerside, Prince Edward Island, to observe the fireball in the sky as it settled below the sea. 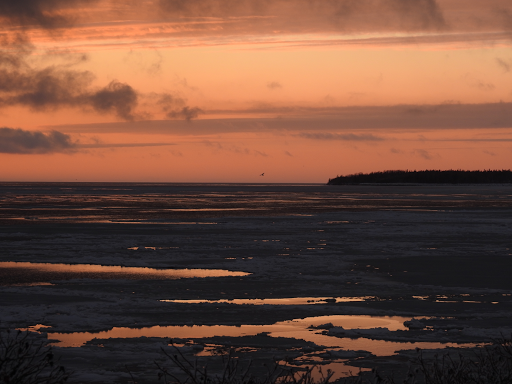 The ice on the harbour, formed in the last few days, was visible because of the last rays of sunlight. 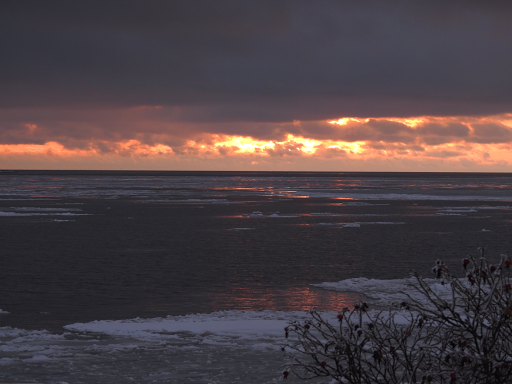 As the sun disappeared, the bank of clouds advanced in an effort to cover the entire harbour. 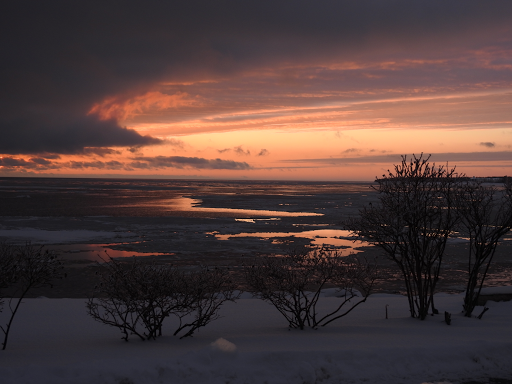 Twilight held onto its colour as the threat of an impending storm gathered. We paused and took in the beauty. As the sun sets on 2016, I wish you a New Year filled with health, peace and contentment. 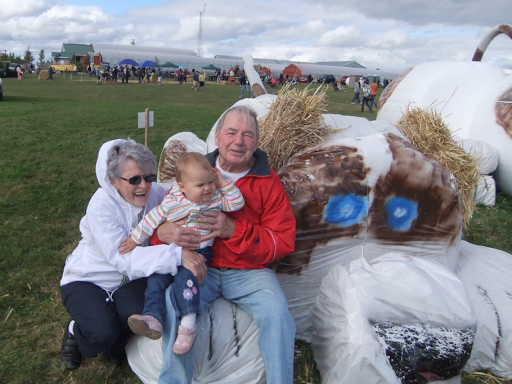 In September of 2012, my husband's parents, Melvin and Sylvia, travelled from Corner Brook, Newfoundland to visit us in Prince Edward Island. 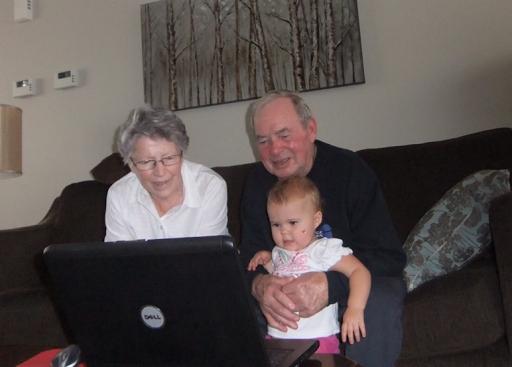 At that time, they had one great grandchild, our granddaughter, Sylvie, who was one year old. While they were here, they recorded a story book which they dedicated to her. The next year, Melvin died. On Christmas Eve this year, Sylvie and now a second great grandchild, Caitlin, listened to the story read by both of their great grans. Caitlin was mere weeks old when she met her dying great grandfather. However, she knew his name and was thrilled to hear his voice. She recognized her great grandmother's voice immediately. Both girls loved the book and hearing the voices was special for them. I was with Melvin and Sylvia the day they recorded the story. Though he did not realize how soon he would depart, Melvin was emotional as he did his part that day. The implication of the gift was not lost on either of them. 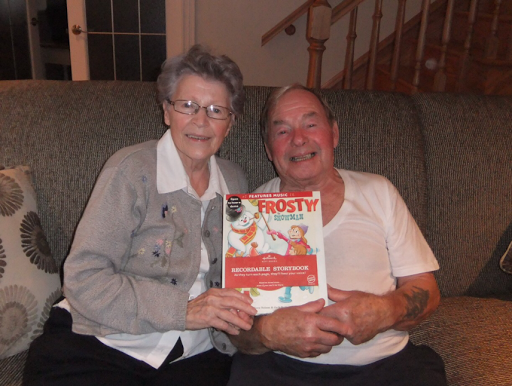 As I listened to the story with the girls on Christmas Eve, I knew the book had accomplished what Melvin and Sylvia had hoped for. The girls felt the love and affection their great grandparents had for them, across the miles and through time. Frosty melted the heart. 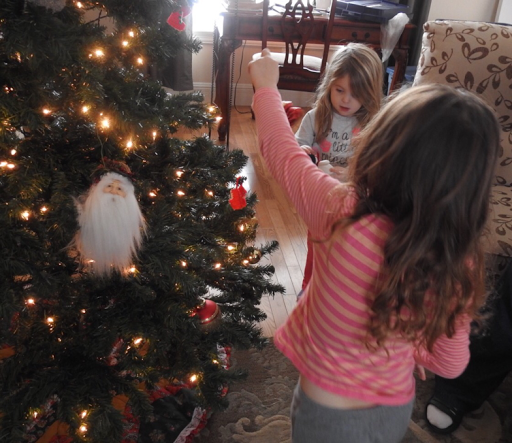 Last week, two days before Christmas, we decorated the tree with our granddaughters. If not for the girls, we probably would not have had a tree this year. 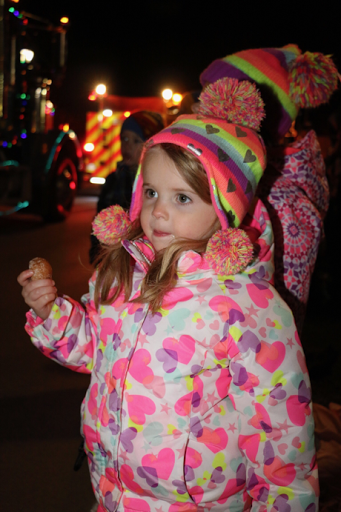 However, their enthusiasm and interest made us pull out the old artificial tree again this year. 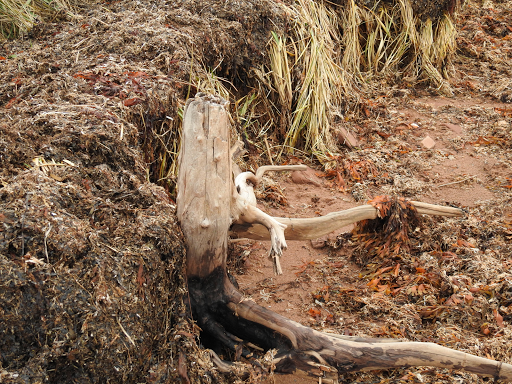 They did a great job; we left the tree the way they did it. I remember when my grandmother lost interest in having a Christmas tree. She gave up the real tree first and bought a seven foot, silver tree on which she put the old ornaments, without the lights. As she aged and began to lose her memory, my uncle replaced that tree with a small table top one. 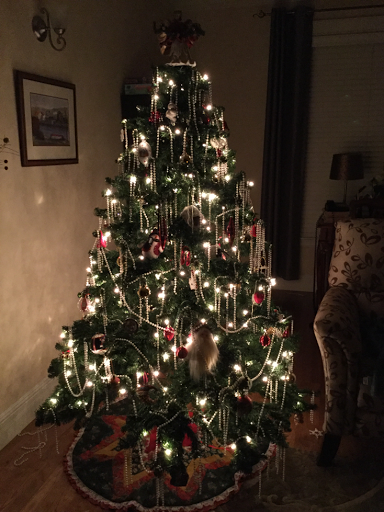 While my uncle was alive, Nan had a Christmas tree, even when she didn't remember what it was. She enjoyed it though and pointed it out when you visited. Long after Nan was gone, my mother scaled down her Christmas tree too, from real to artificial at first. Then she had a table top tree which we coaxed her to use and decorate. She did so to please her family but she had lost interest in the festivities. Now, I know too. 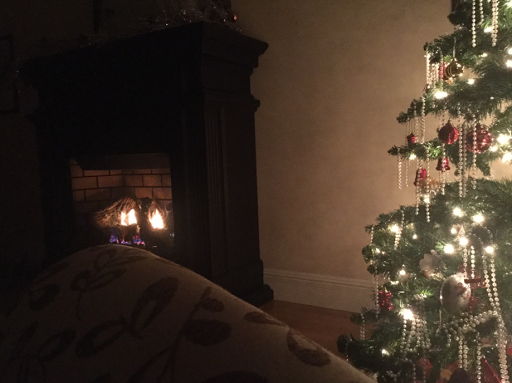 When we put up the tree for the girls, I thought of the women in my family and finally, I understood how they felt. When I was encouraging Nan to decorate for Christmas, I was a child caught in the excitement of the season. "How can you not have a tree, Nan?" With Mom, I was in the child-rearing phase of life, caught in the flurry of life and events we create for and celebrate with our children. Nan and Mom had done that same thing, in the way common for their prime of life. 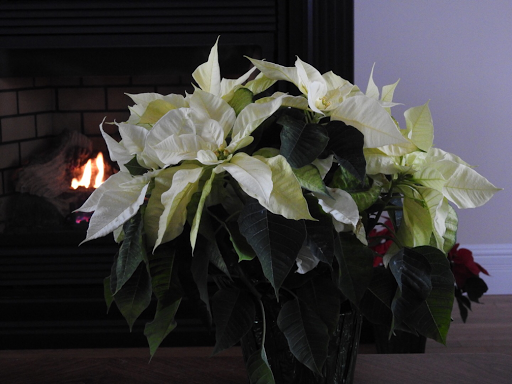 As they aged, they went along with the decorating because they were part of our family and wanted to please us. 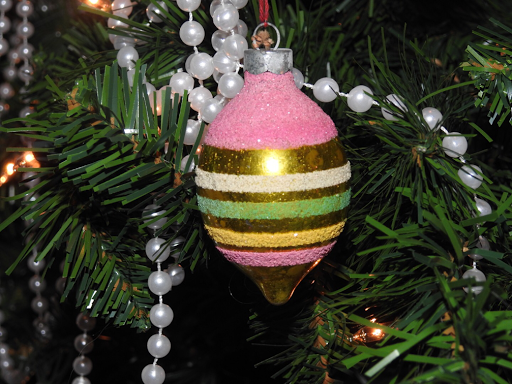 Our tree has some of the ornaments from family Christmas trees of years gone by. 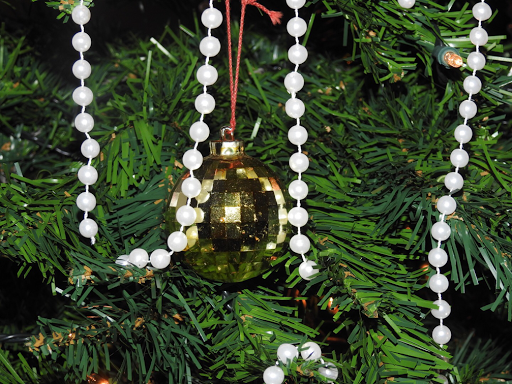 The ornaments have been passed along, wrapped with care and used on various trees over the years. They have no monetary value but they tell their own story about the circle of life. In that way, they are priceless. One day, my daughter will understand too. Peace to you and your family this Christmas and Holiday season. 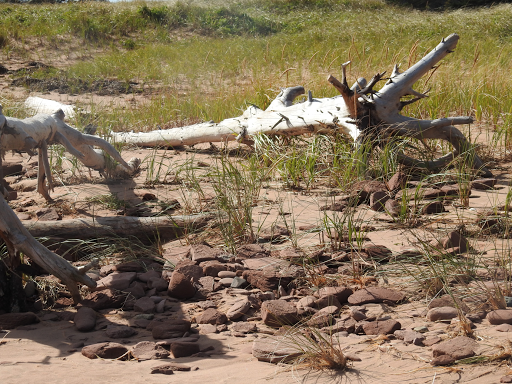 Buchans, Newfoundland is located in the central part of the island, surrounded by wilderness and abundant wildlife. 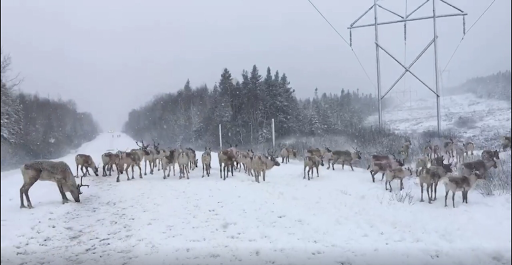 On the way to and from Buchans these days, you may have to pause and share the road with reindeer, known as caribou in North America. The animals are migrating this time of year to winter grazing areas with plenty of caribou moss, their winter food source. 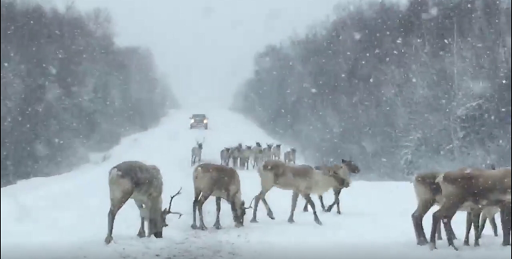 When we lived in Buchans, driving over the highway was often a wildlife adventure. 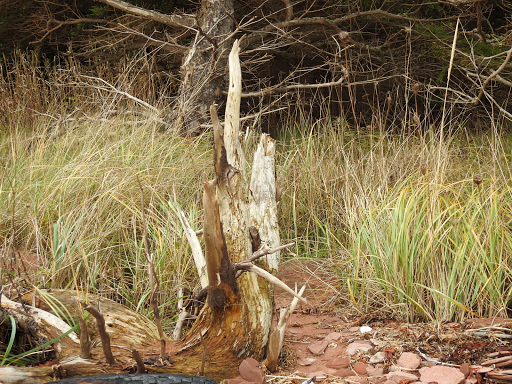 We saw many animals over the years, black bears, foxes, lynx, rabbits, moose and caribou. One night, we encountered hundreds of frogs crossing one section of the highway. 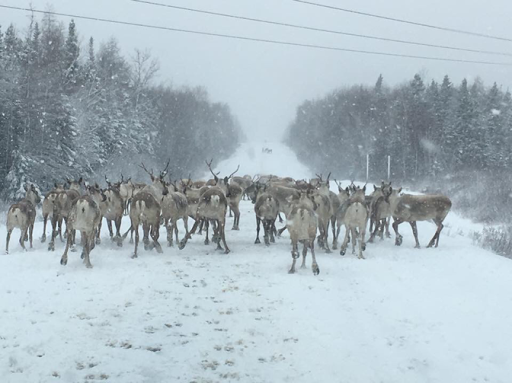 Now, the caribou are numerous, more dangerous to motorists, but beautiful in their natural habitat. I suspect they are in training, in case Santa needs them on Christmas Eve. His own reindeer may be tired and need a rest as they travel around Newfoundland. 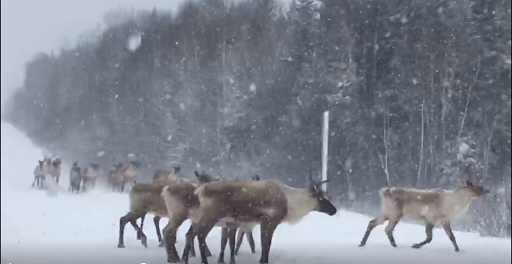 Even the caribou in Newfoundland are eager to help those who come from away. Photos by Reneé Michelle Ball. Thank you, Reneé. The national news showed the events of the day. People at a Christmas market in Germany were attacked by men driving a transport truck which mowed them down. A Russian diplomat was killed in Turkey. A vacationing Newfoundlander was one of ten killed in Jordan. People, including children, in eastern Aleppo, waited for transport out of the death and destruction which surround them. Acts of terrorism fill the news. There is no peace on earth this Christmas. For several years during my teaching career, I sang with an ecumenical choir in Buchans, Newfoundland. We sang a variety of music, but one of the songs which spoke to me was Let There Be Peace on Earth. "Let there be peace on earth and let it begin with me." So true! How can we expect peace on earth if each of us doesn't do our part to create peace in our own lives? Why do we allow petty differences and misunderstandings to separate us from people? Why do family members not speak to each other, or neighbours not even acknowledge each other? Pride can be so destructive. It can keep us from saying, "I apologize," or "I am sorry." It can also keep us from accepting an apology and cause us to harbour resentment and anger, which are detrimental to peace and are self destructive. They keep us from being our best selves. 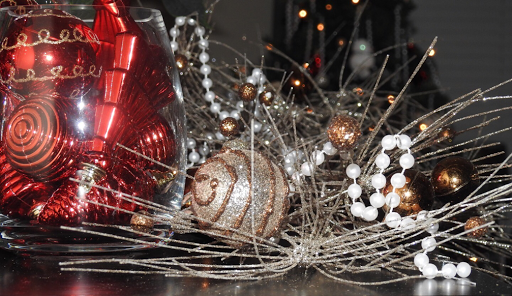 We can't expect peace this Christmas or any Christmas until it begins in our own lives. A movement towards peace starts with each individual who makes a commitment and lives that commitment in her relations with others, family, friends and even those she doesn't know. It begins with an openness to others. I learned of openness from my father. He had many reasons to be angry and resentful towards his father. Instead, Dad worked at developing a relationship with him, and his father wanted and worked on that relationship too. We all benefitted from this reconciliation, knowing our grandfather and learning how to let go of resentment and past hurts. Sometimes, the hurts are too great and the relationship cannot be restored but forgiving and letting go means you can move ahead, free and unencumbered. Lacking the anger and resentment, you can be open again, not needing to protect yourself any more. I am a work in progress at peace. I know what I have to do but I haven't been successful all the time. Let it begin with me indeed. We are dog sitting for the next month. 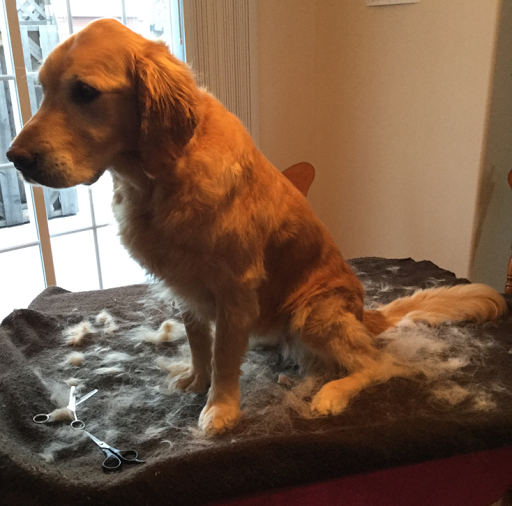 Georgie, the golden retriever, is visiting again as her family heads out of the province. We take the opportunity to groom her when she arrives. Georgie has her winter coat on these days and it is thick. When we bathe her this time of year, her skin barely gets wet. Georgie is almost seven years old now and after all these years, she can proudly claim she has us trained. This is a dog which is out twice a day at her home. Here, we are trained to allow her out any time she goes to a door and waits. 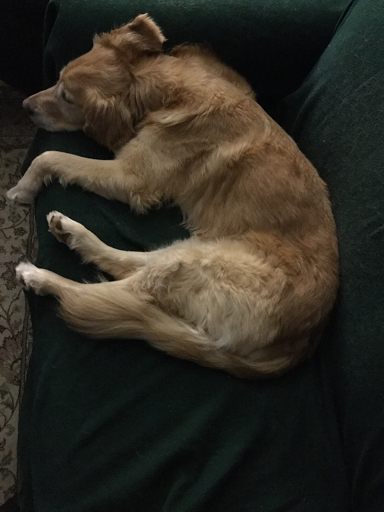 She is lean and trim and at her home, she only eats kibble. 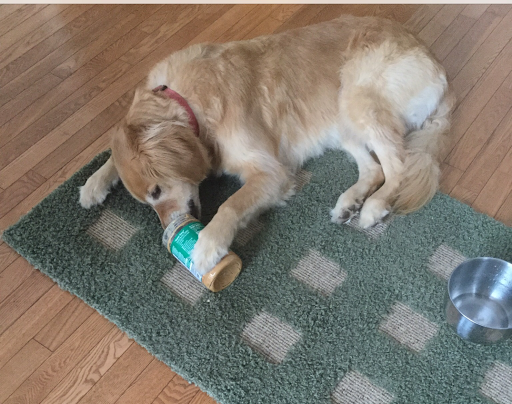 Here, she enjoys the peanut butter jars we are trained to save for her before we recycle them. She likes a spoonful or two of the nutty treat left in the jar which she licks out with her long tongue, as she holds the jar with her paws. Walking every day is one of her favourite things; she likes to go after breakfast and we oblige, of course. Yesterday, as we headed out, Georgie barked, something which she does not do when she is on the lead. However, as we discovered, she does bark at foxes, as one crossed the road a short distance from the house. The fox was unperturbed by Georgie's vicious sounding hello. These are the early days of Georgie's latest visit and we have lots of patience for her antics. However, by the time her family comes home, we will be more than ready to have our lives back to normal. And besides, I like to stretch out on the couch! It doesn't take long. 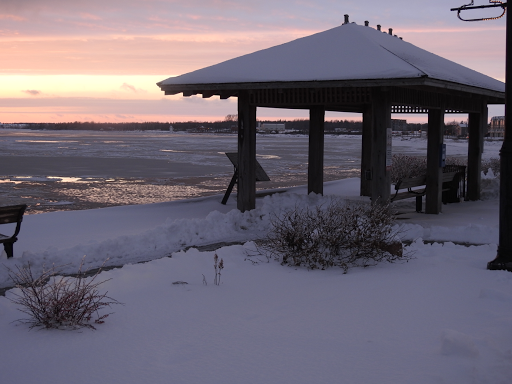 A few days of freezing temperatures and the harbour at Summerside, Prince Edward Island begins to freeze over for another winter. It won't be long now! She stood with the primary choir and sang every word of the first song. The second one had actions which she did with enthusiasm. 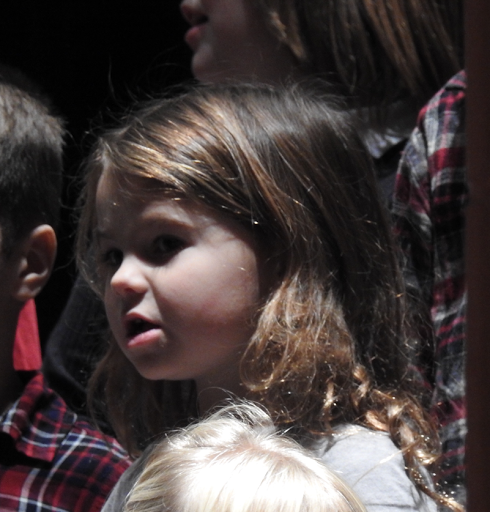 As I watched my granddaughter, Sylvie, sing with the other children, it brought me back to the days when I was a child, singing with the many choirs I enjoyed over the years. 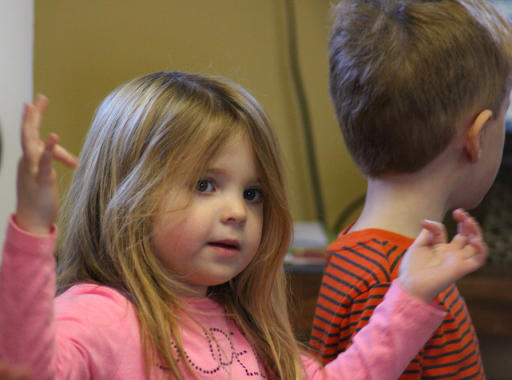 A choir is a great experience for a child. You learn your part and listen to the others around you as you raise your voice with theirs. You exercise your memory as you learn the music and the words. You follow the director as she helps you explore the dynamics of the music. The discipline of the practice and the proper behaviour as you stand and sing are valuable lessons. 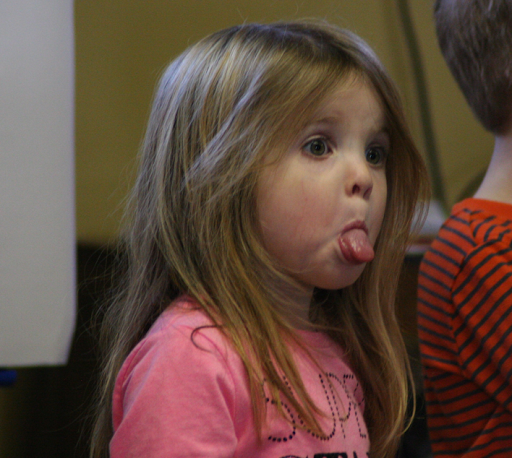 Sylvie knew what she could and couldn't do as she stood on stage with the other children. Five is not too young to learn appropriate behavior for this setting. Times have changed however. The music at this concert was secular Christmas music. When I was young, going to a Catholic school, the music was religious carols. 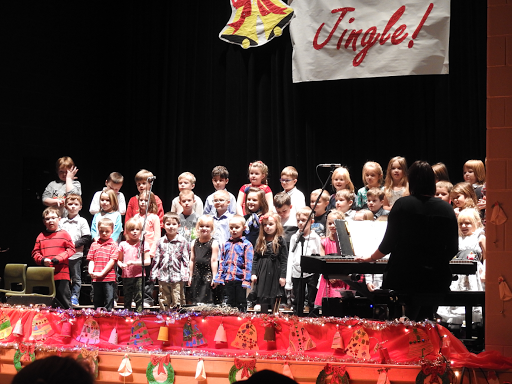 In addition, today the teacher puts the music on Youtube for the children to watch and sing along, repeating as often as they need for mastery of the music and lyrics. I was accustomed to hours of repetition with the music teacher directing. Technology has changed most aspects of our lives, including choir training. What hasn't changed however, is the dedication of wonderful choir directors and the way children enjoy singing together and performing for others. Technology won't change what is really important. We prepare for Christmas as we have every year, but our North American part of the world has changed. In the recent past, we searched for the truth. Just give us the facts, please. We relied on the facts; we could handle the truth. Not so any more. Lies fill the television, internet and social media. Prominent people will outright lie and say whatever suits them, deny comments they've previously made and ignore questions about them. "News" stories which are entirely fabricated, are believed by millions of people. Factual information is inconsequential. Today, many parents, as always, endeavour to teach their children to speak the truth. How do we teach them now when a part of society will not reinforce those beliefs and certain leaders have a nodding acquaintance with the truth, if that? What value does truth have any more when all around us lies are passed as fact, news is fabricated, and many people are all right with it? As we search for a way through the next number of years, I expect another shift in attitude as our youth deal with the ways of the new world order as well. This latest development will require much guidance and discernment for all of us. Labels: facts, lies, social media. It is that dreaded time of year again, time to wrap the Christmas presents. I always delay the task until necessity dictates the parcels have to go in the mail. Then, it begins. That's how it starts anyway. Then, a black hole opens up in the room. 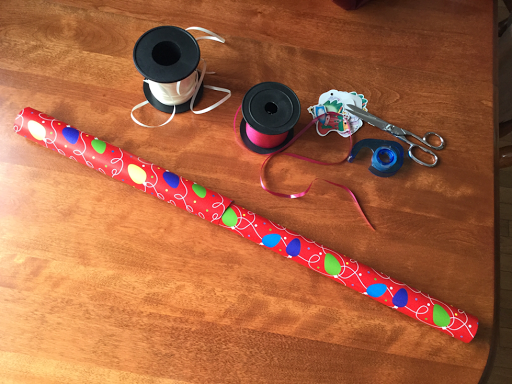 Scissors, tape, tags or any of the other wrapping essentials disappear and reappear again numerous times during the process. The search increases the time necessary to finish the job. Frustration is time consuming! Besides, how does one wrap some of these unusual shapes? Gift bags can be a good solution but they don't always work. Boxes help but they aren't always the right size or shape. Regardless of the wrap used, the implements continue to disappear. That black hole doesn't respect anything. Eventually the wrapping is done, often after multiple attempts, due to my dislike of the task at hand. Perseverance to complete the job in one sitting is not one of my virtues. 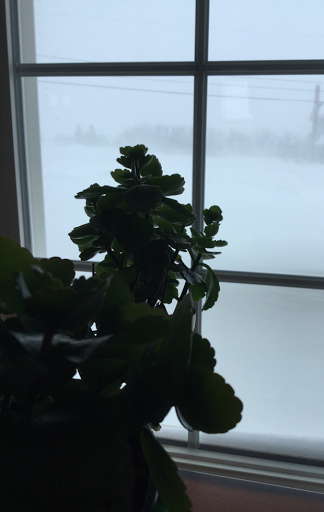 It was the first storm this season. Since most of the outside work was done, we were ready. The lights flickered several times and the flashlights, candles and matches were ready too. Electricity was off in a number of areas of the province, but we have a generator in case of an extended power failure. Readiness is second nature to former teachers. Ready. Such a curious word, read with y attached. Much of life requires readiness, reading the signs and preparing for what's to come. We prepare kits in readiness, first aid, emergency, tool, road kits for the car. Read the signs, prepare, be ready. If only it were that easy. Life hums along, busy, but more routine with age. The familiar provides comfort, requires little effort in its familiarity. Breakfast at 8, lunch at noon, dinner at 5, bedtime around the same time every night. Familiar meals are on the menu, the treadmill counts out the kilometers each day if we can't get outside. Volunteer work, shopping, friends and family fill the days. 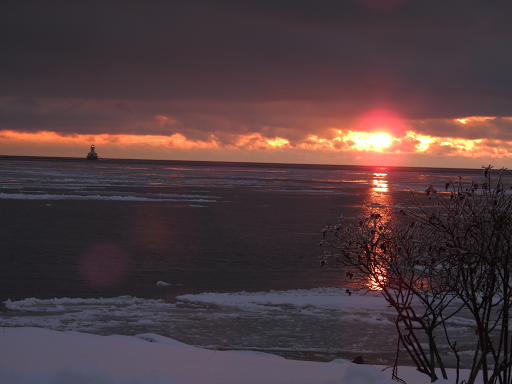 We haven't seen the sun much in the last month and the temperatures are hovering around freezing. It is time for a reminder of warmer times and places of natural beauty. 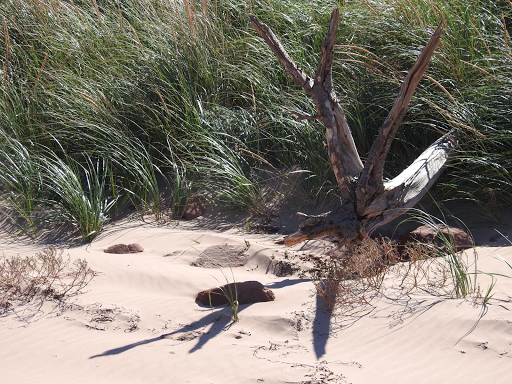 You can find many interesting items on a beach. 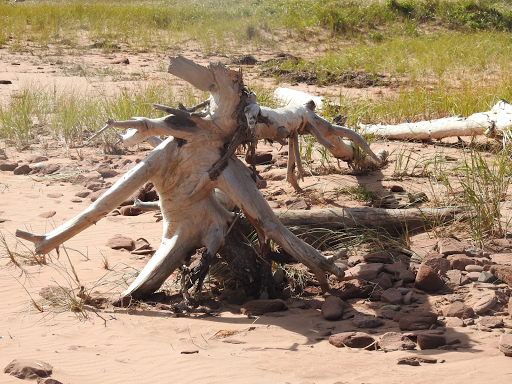 Some of the most interesting include whitened, weathered tree stumps which are natural sculptures. 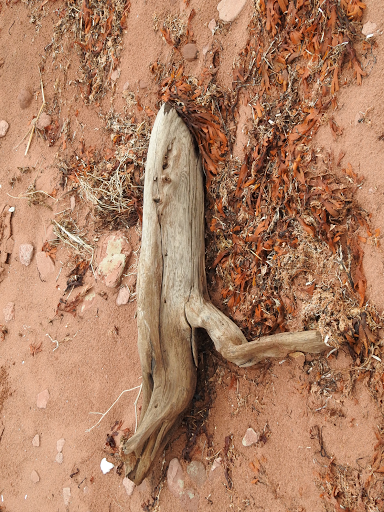 Sometimes, a large part of the trunk is still attached. Other times, the sculpture appears stained. 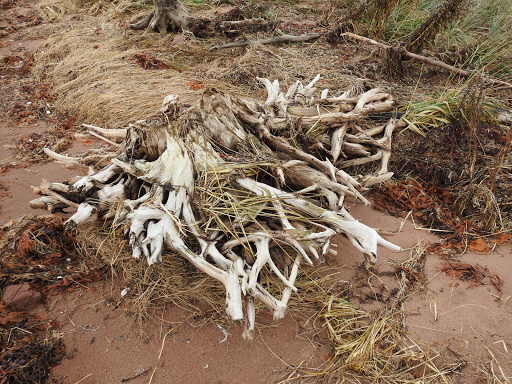 Some sculptures find their way into a fire on the beach. 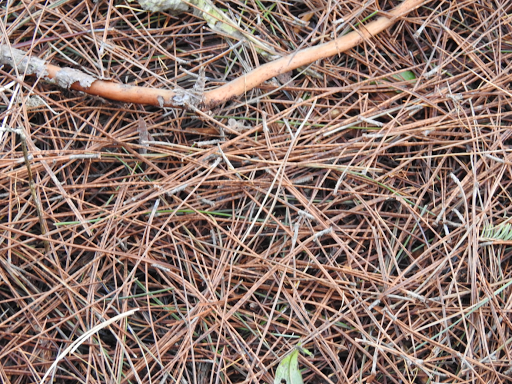 Sometimes, part of the root system is present in an intricate design. 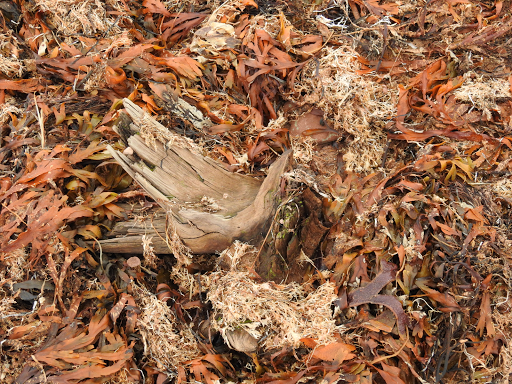 Or, seaweed covers some of the sculpture. Some sculptures stand straight, reaching for the sky. or do you prefer aliens? All you need bring to the beach is your imagination! "Is that wonderland jam, Nanny?" my three year old granddaughter asks as she waits for the partridgeberry jam for her crackers. Wonderland is what Caitlin calls Newfoundland. "Yes it is," I say as I spread the jam for her and smile. Caitlin doesn't have any memories of Wonderland although she has been there. 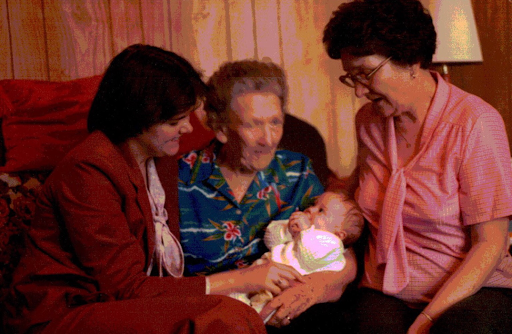 She was two months old when her mother took her to Corner Brook to see her sick great grandfather. 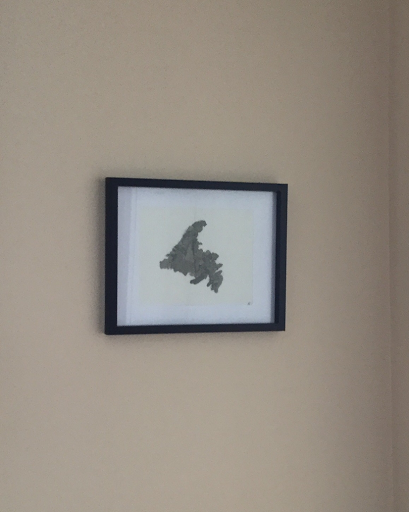 Somehow, in Caitlin's mind, Newfoundland is Wonderland. I know what she means. While I love my current island home, my soul belongs to Wonderland too and this time of year, as Christmas draws near, my thoughts always turn to home. The people, the rugged landscape, the way of life, are part of my being. It is a place where weather is a conversation piece, where wind predominates and fog, rain and snow are common. You don't visit for the great weather. However, that weather is one of the features which binds the people together, as they fight the elements and struggle in that rugged environment. Humour is a way of life too. The people see the lighter side of life and can easily share a joke to ease a burden. 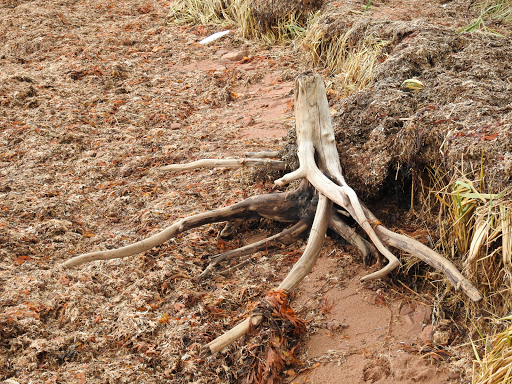 We are deeply rooted in our island home. It is said you will know all the Newfoundlanders in heaven. They are the ones who want to go home. We are also a friendly, hospitable people as evidenced by the events of September 11, 2001. The people of Gander and other central Newfoundland communities, opened their hearts and homes to passengers of over 30 giant aircraft, forced to land while in route to their destinations in the United States on that fateful day. They landed in Gander, almost doubling the size of the town in one day. The story of their reception in Gander is now on its way to Broadway as the musical Come from Away. It played in Gander and is on stage now in Toronto, opening in New York in March. It has received rave reviews. In the face of some of the worst which humankind can do to one another, there was an example of hope during those tragic days. "Yes, Caitlin. There is a wonderland." The story of the musical when it played in Gander is here. 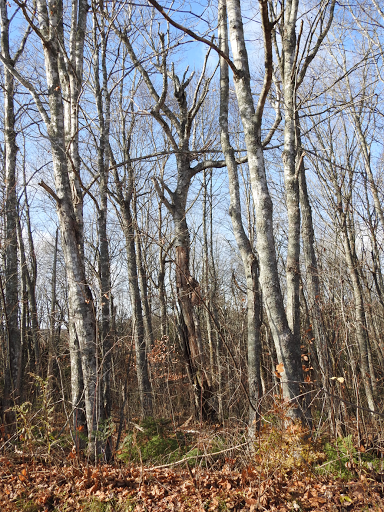 When the leaves are gone, tree trunks are exposed and beautiful! They grow to the sky in their own unique ways. we can read at our leisure! 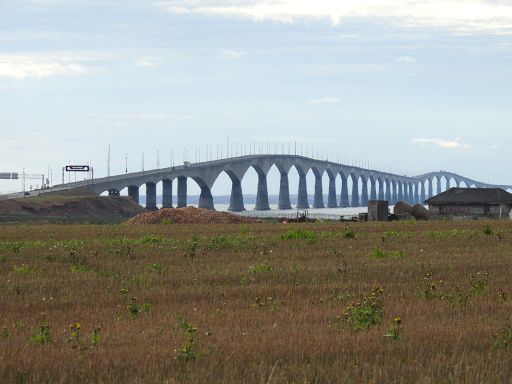 During our recent excursion to Seven Mile Bay, my husband and I observed the bridge from one of the roads to the shore. 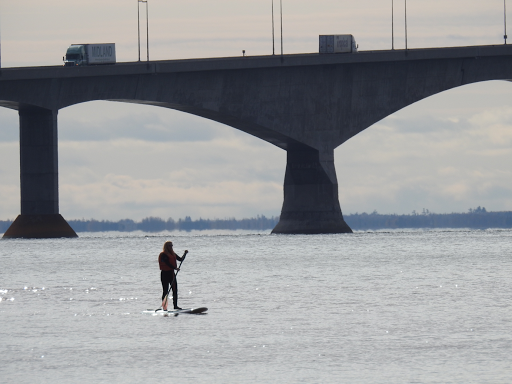 As we approached the shore, we saw a paddle boarder out on the water with the bridge as a backdrop. 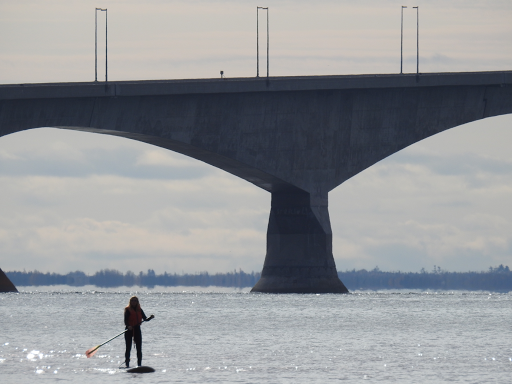 It was only 9 degrees Celcius that day and one could imagine how cold the water was if should she topple. However, the young woman had no trouble staying upright. My elder self imagined her as a yoga partitioner with a keen sense of balance though her youth probably gave her the physical stability. traffic entered and exited the bridge, including many trucks. She appeared oblivious, peaceful. She had her own place of serenity in the world. Watching her, we were at peace too, a peace unknown in much of the world. It is one of the reasons we love this place. 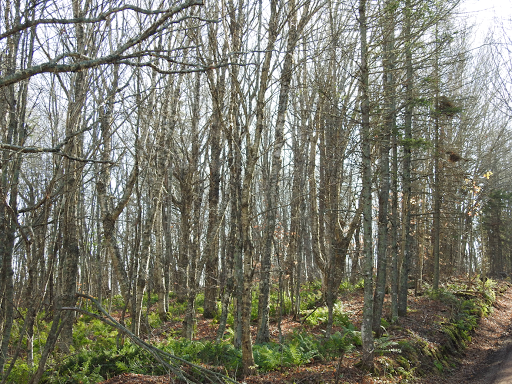 A forest is one place where reduce, reuse and recycle are all done in an exemplary manner. 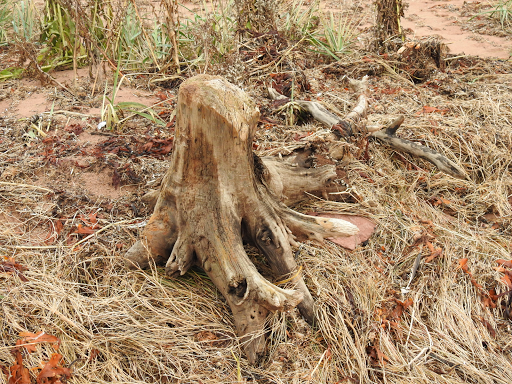 Plants, or parts of plants, having lived their span of days or years, decompose into the earth or become a substrate for other organisms to speed up decomposition. All goes back to nature. 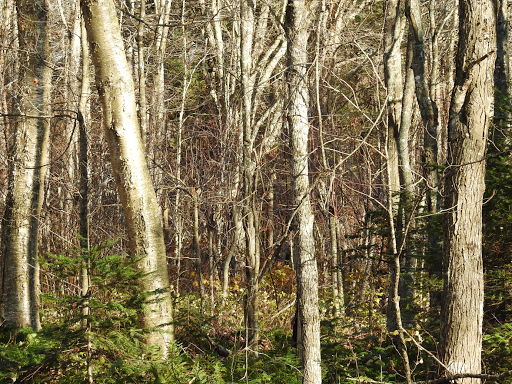 Leaves of the deciduous trees never go to waste in a forest. 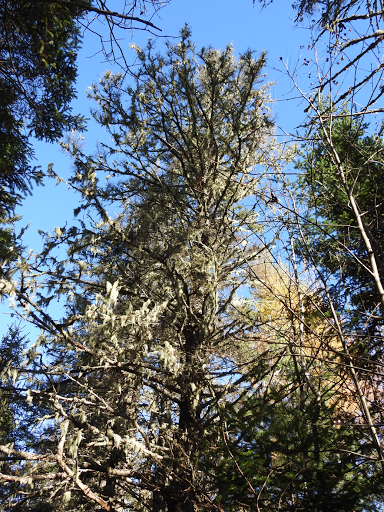 Neither do needles of mature coniferous trees like pine, all of which add to the humus or organic material in the forest floor. 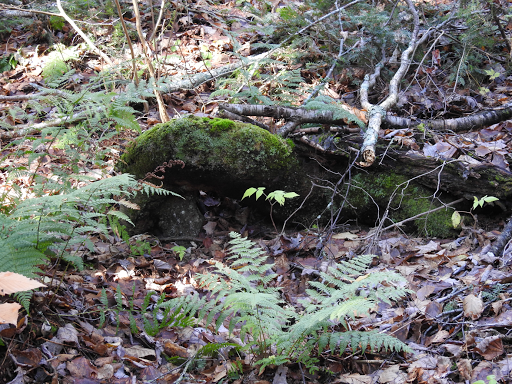 Fallen trees or parts of them become homes for moss, which, over time, breaks down the tree, returning it to the earth. Bark mushrooms take their place on trunks of dead or dying trees, breaking them down further as well. 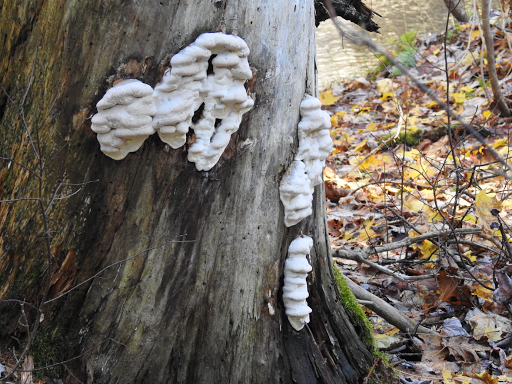 The curious jelly-like slime mold also does its part on old branches and tree trunks. 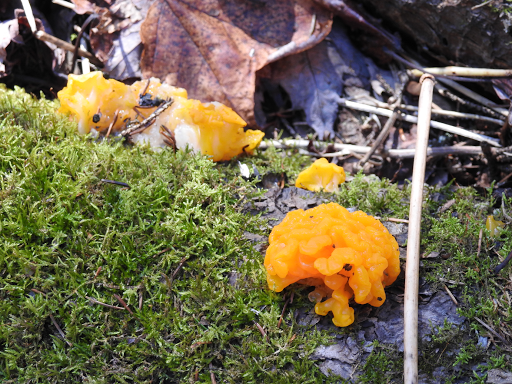 One such mold is called Witch's butter and according to Eastern European legend, if it appeared on one's door or gate, it meant one was targeted by a witch's spell. 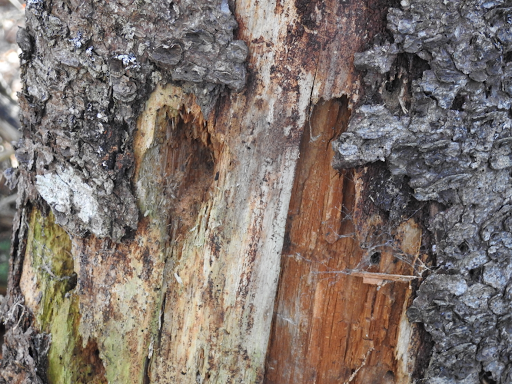 Animals take advantage of the environment too, as insects invade trees and woodpeckers dig holes in search of them. Then there is Usnea, or Old Man's Beard, which hangs from branches and trunks of old trees. It is a non-plant, consisting of algae and fungi in a mutually beneficial relationship. Its presence in a forest indicates the air is clean since Usnea absorbs pollutants and will die in extreme cases of pollution. Our ancestors used it for its antibiotic and anti-fungal properties and, even today, it is used in emergencies in the forest. In my youth, I studied biology in university. Over my teaching career, I left teaching science and biology for administration and counselling. This past year, I have come to realize how much I enjoyed biology and missed it. I, too, am back to nature.